Parenting is a competitive sport these days. With all the pressure on the modern parent, a little comic relief is not just welcome; it's a matter of survival. Because I'm the Child Here and I Said So offers a much-needed hilarious first-aid kit for parents of all types. Between the fat stacks of parenting books designed to engender paranoia and hyper-competitiveness, and the culture that demands everyone must "have it all," today's parents don't stand a chance. 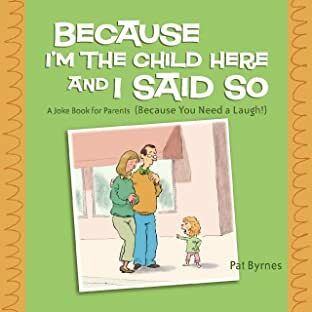 Because I'm the Child Here and I Said So by cartoonist Pat Byrnes is a gleeful send-up of modern parenting: the obsession, the sport, the pseudo science, and all the maddening challenges parenting presents. Each full-color cartoon features a smart punch line that will make you smile (or wince in recognition): * "A birthday party? Didn't we already do that kind of crap with your older sister?" * "I couldn't find a sitter, so I got a video." * "Just remember, son, it doesn't matter whether you win or lose -- unless you want Daddy's love." 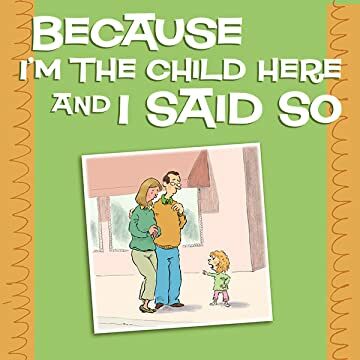 Be advised, if you find yourself relating to any of the parents in this book, you need to chill out. Fortunately, Because I'm the Child Here and I Said So is the antidote to all your parenting woes. Whether you keep it for your own sanity or give it to a desperate parent, the cartoons of Pat Byrnes will delight and amuse.